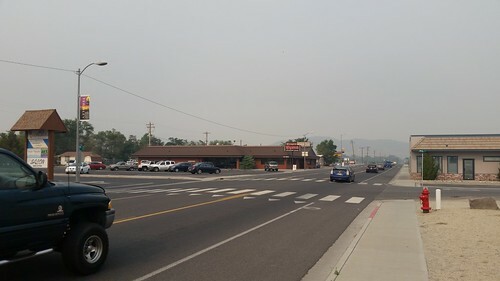 The haze from the various fires, most notably for us the Perry Fire at over 10,000 hectares (over 25,000 acres) has intensified. The smoke is thicker than the photos indicate. At times you could almost look at the sun without worrying about your eyes, much as it was on the worst day at Sasquan in 2015. 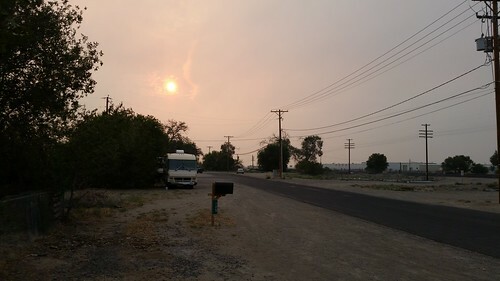 This afternoon, when we went to the grocery store, Lisa pointed out that we are now getting an accumulation of ash from the fires. Not a lot, but noticeable when we opened the door on the minivan and some of the ash fluttered off. I'm glad I didn't need to go to Reno yesterday, because I-80 was closed due to a fire there. It's way too easy for wildfires to get started, and it's so hot and dry that they burn very well. It appears that the Perry fire took down an important communications tower, and thus I both my personal and work cell phones are offline until further notice. I'd always assumed that the tower I can see out the living room front window was the one providing service to my phone, but either it is not, or else it depends on a different tower or something else that's disrupted, either by the fire or something else. While I was having breakfast, the folks at the Wigwam were talking about the lack of cell phone service. So I can only get data access for my phone where wi-fi is available for now. There is work that needs doing on the property, but it's hard to breathe with all of this smoke in the air. Lisa did get up and do some work on the air conditioner on the trailer that probably has bought us a little more time until the parts and coolant arrive to recharge it. More about that later. Update, 20:00: I may have spoke too soon about the air around here. 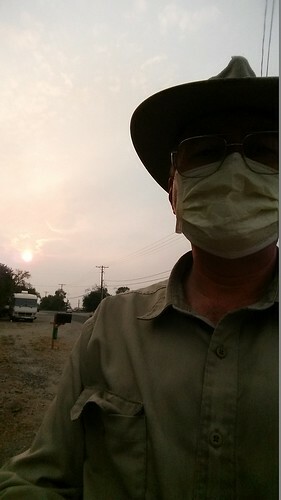 This afternoon, as I mentioned above, we started getting ash fall from the fire, and when I did have to do some work outside, I wore this face mask to try and fend off the ash. As the sun headed for the horizon into the haze, it got pretty ruddy out there.